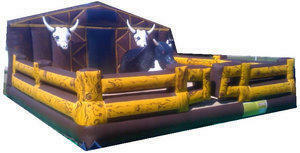 To enhance the safety of the mechanical bull, it has been fitted with a unique Automatic Stop System. As the rider grabs the rope, the operator can activate the mechanical bull. As soon as the rider falls, the rope is released and the mechanical bull stops instantly. Its Soft Foam Safety Head© provide a safer and fun ride. Riders must sign Waiver of Liability. Minimum age: 18+ years or must have Guardian Consent present.